Today, I'm reviewing The Heiress (1949) starring Olivia de Havilland. 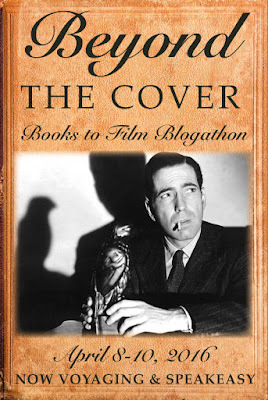 This article is part of Beyond the Cover: Books to Film Blogathon hosted by Now Voyaging and Speakeasy. 19th century American author Henry James is the great exponent of literary ambiguity. His distinctive fictional works, which are mostly about upper-class Americans, are renowned for their exquisite portrayals of the inner lives of female characters, and their analysis of the complex moral dilemmas that faced many people during the straight-laced Victorian era. James' 1880 novella, Washington Square, which was adapted into the 1949 film, The Heiress, deals with both these themes. 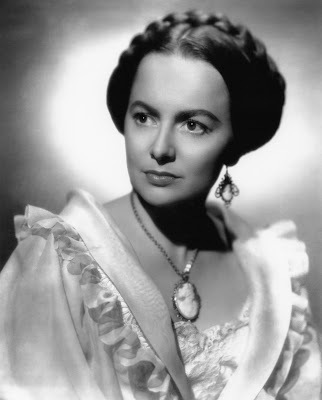 The heroine, New York society heiress Catherine Sloper (Olivia de Havilland), learns harsh lessons about a woman's place in 19th century society after she is cruelly treated by both her father (Ralph Richardson) and the man she loves (Montgomery Clift). 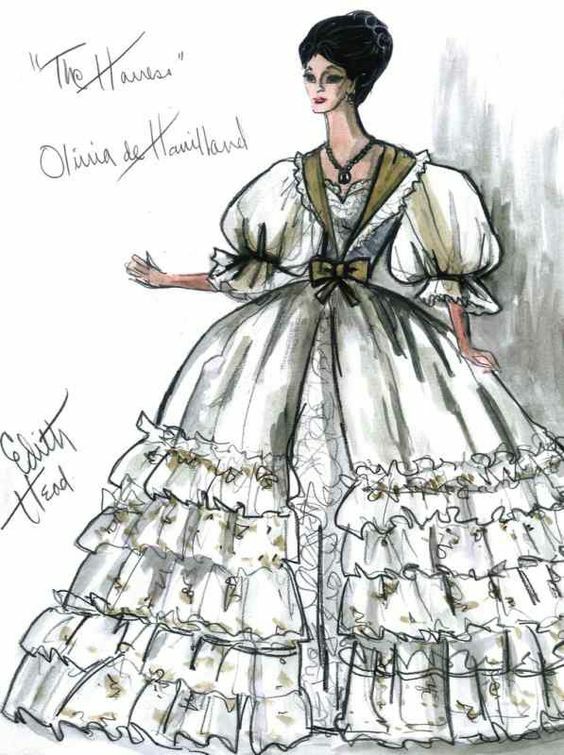 The Heiress begins when Catherine is an awkward and extremely shy young woman who has trouble attracting suitors despite the fact that she will receive an enormous inheritance from her father, who is a physician for well-heeled New Yorkers. Catherine meets a young man named Morris Townsend (Clift) at a party, and despite the fact that he has little money and no job, she falls madly in love with his good looks and charming ways. Doctor Sloper suspects that Morris is just a fortune hunter who will squander Catherine's money, but despite her father's objections, Catherine quickly accepts Morris' marriage proposal, and the young couple plan a late-night elopement. James based Washington Square on a family story told to him by a close friend. The novella was very popular with the reading public, but James always disliked Washington Square because he felt it was too simplistic and much more melodramatic than his other works (he tried, without success, to get it removed from a collection of his works). However, what made for a poor novel worked well as a scripted drama. Playwrights Ruth and Augustus Goetz adapted Washington Square into a 1948 stage play, The Heiress, that was a triumph both on Broadway and the London stage (Richardson originated the role of Doctor Sloper in the West End production). 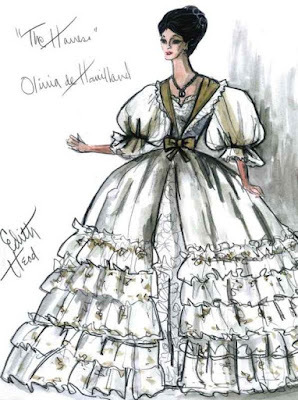 One of Edith Head's sketches for The Heiress (1949). When de Havilland saw the Broadway production, she knew it was the perfect choice for her next film role. After laboring for a decade in thankless parts for Warner Bros., de Havilland had established herself as one of the leading actresses of the 1940's, winning an Academy Award for To Each His Own (1946) and appearing in such meaty dramatic fare as The Snake Pit (1948) and In This Our Life (1942). Paramount Pictures executives bought the property as a star vehicle for de Havilland, and they assigned veteran director William Wyler to make a lavish adaptation. Paramount executives cast Clift, who was then a hot property thanks to his role in the Western Red River (1948), to play Morris. Clift, who prided himself on his modern method-acting style, immediately protested. Clift didn't like the idea of playing a villainous character, and he also felt his persona didn't fit well in a costume drama (Clift did not alter his demeanor at all during filming, and his tendency to slouch and mumble while shooting his scenes drove the classically trained Richardson to distraction). Instead of listening to Clift's pleas, Paramount executives just ordered the Goetz's to water down the gold-digging aspects of Morris' character and make Catherine's suitor a much more romantic figure. In many ways, the shifting motivations of the Morris character serve to make The Heiress more ambiguous than even James intended. In fact, for much of the film, it's hard to know who to root for, which must have puzzled forties audiences who were used to much more clear cut heroes and villains during their weekly trips to the cinema. Although The Heiress was praised by critics and won four Oscars, including best actress for de Havilland, it was not a box-office success. Paramount received hundreds of angry letters from fans (mostly teenage girls who had crushes on Clift) who were upset by the film's not-so-happy ending. Watching The Heiress today, it's clear that the film is among the best screen adaptations of James' work (The Innocents (1960), which is based on the ghost story, The Turn of the Screw, is another stellar adaptation). The film not only captivates audiences with the engrossing melodrama of Catherine and Morris' love affair, but it also causes them to ponder moral dilemmas that are presented in a very ambiguous manner. For example, is it right for Morris to pursue Catherine mostly for her money even though he is fond of her? Or, is it necessary for Doctor Sloper to be so forthright with his emotionally fragile daughter when he reveals the true nature of Morris' character? I think there's more than one answer to both of those questions, which makes up a large part of the greatness of this movie. The Heiress is available on DVD. Wonderful review! That is interesting that James didn't like the novel. I've always been curious to read it, but that's certainly a unique occurrence that the movie is more ambiguous than it's source material. You're right; it does elicit mixed reactions. On the one had, I don't want Catherine to be deceived by Morris, but on the other hand they might still have been happy. Excellent review of the film; very informative and thought-provoking. I can't help but think of the upper class of the period as so staid, but the emotion in the characters is almost too much to handle. The trailer certainly was correct in that the stars, director and story are perfectly blended. 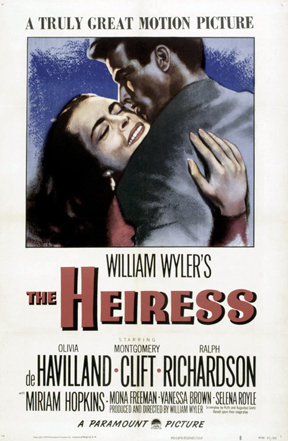 I think All the King's Men is a very good movie, but my choice for 1949 best picture would have been The Heiress. Powerful film and Olivia breaks your heart in this one and when the lights go out in her eyes when she realizes the truth is a magnificent piece of acting. Ralph a true S.O.B. in this one. Olivia also does a great job of lowering her voice to show her character's changing demeanor throughout the movie. I didn't realize this film wasn't a box office success, but I can well imagine the letters the studio received from irate young girls. I can also well imagine Richardson's frustration with Clift's acting style, although I like the friction the two of them have on screen. You know, you've made me want to change my plans for today and watch The Heiress! The fact that Clift and Richardson didn't get along actually helped the movie I think. LOVE The Heiress! So glad you wrote about it! Thank you so much for joining in!